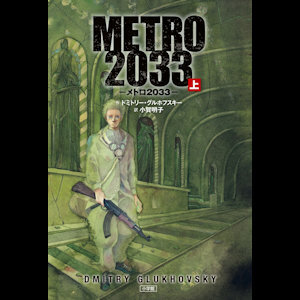 Like most Americans who know anything about it, my first exposure to Dmitry Glukhovsky's Metro 2033 was through the video game of the same name from a few years ago. 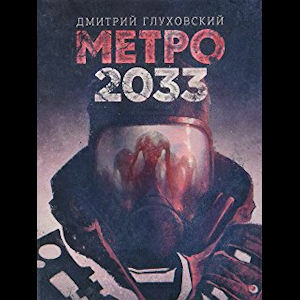 An interesting take on survival horror, Metro 2033, the game, is a corridor shooter that takes place in a post-apocalyptic version of Moscow's underground metro system, where civilization has broken down into strange pockets of humanity and everyone is threatened by the omnipresent horrors of violence, mutant infestation, madness, and the supernatural. I loved the game enough to look into its origins and was surprised to discover that the novel it is based on is a pop culture phenomenon throughout Russia and Europe. Originally published online in 2005, where it is still available for free (as long as you can read Russian), the book became a launching point for a juggernaut franchise of which the video game is but one arm. Despite my reservations about Russian literature, I tracked down an English-language copy of the fairly lengthy book (which, at the time, was difficult in the U.S.) and eagerly tore through it over the course of one week. It's important going into Metro 2033 to note that many of the hallmarks of Russian literature that I find so infuriating--the long, meandering chapters; the intense focus on mood above all else; the seemingly unstructured use of narrative that bucks every Western tradition; the wonky and unavoidable translation oddities; the disinterest in poetic phrasing or clever language; and the obtuse philosophizing--are almost all present. However, this novel manages to hypnotize me the way no other Russian novel has, and unlike the dusty stack of Slavic greats I've barely cracked open, I've actually finished Metro 2033, not once, not twice, but three times. Perhaps it's the genre--clearly, I'm a science-fiction nut--or perhaps it's something unique to Glukovsky's writing style that I can't quite put my finger on. Whatever it is, there's something about this novel that draws me in, making it a far more entertaining read than War and Peace and The Brothers Karamamazov. For the uninitiated, this is the story of Artyom, a young man raised in the Moscow metro system nearly two decades after a largely unexplained war has rendered the world above a mutant-infested nuclear wasteland. Living at a remote metro station near what used to be Moscow's famous Botanical Gardens, Artyom is given a mission to seek out the heart of the metro, a massive junction of four major stations, now known as Polis, and inform the leaders there of the existential threat posed by a new breed of mutant invader called the Dark Ones. This adventure sees him passing through all kinds of threats, from the bizarre, supernatural horror that lies in wait in the darkest corners of the tunnels, to the all-too-real threat posed by human beings with guns and a ferver to rally around a political or religious cause. More than just a profound microchosm of mankind, the metro is a vitally alive universe populated by folks who love to tell stories, spread rumors, and speculate wildly about everything. Concrete information is rare, and things are constantly in flux, with no one really able to say what is going on at other stations or on the surface. It's dark, gritty, and bleak, but it's also fascinating in its exploration of the human condition, stripped of almost all modern convenience and boiled down to a bitter, disjointed essence of a creature clinging desperately to its ascendant past. Artyom is joined by a dizzying, revolving cast of ancillary characters who pop in and out of his story organically, and they each serve to offer a different perspective on the post-apocalyptic world. Some still remember the time before the bombs fell, and some have been so twisted by the new order of things that they are all but mad, though in the metro, madness is far more relative than you imagine. This is simultaneously one of the novel's greatest strengths and one of it's primary drawbacks. The characters are all interesting and help to demonstrate the size and variety of life in the metro, but they come and go so much--with the relatively bland Artyom acting as the only constant throughout--that it gets frustrating. The most important character, though, is the metro itself. Glukhovsky demonstrates an intimate familiarity with every station (so much so that readers would do well to print out a map beforehand; it is inexcusable that the English language version doesn't come with one), adroitly describing each in such detail that the reader will be surprised at how closely they resemble the real locations. He also builds his universe in layers, with the metro as it really exists as the base and topped with equal parts Artyom's experiences and the wild imaginings of everyone he comes across. The metro is full of myth and mystery, and the things Artyom encounters makes it plausible that every rumor, no matter how insane, is grounded in truth. He hears of a station where Satanists are trying to dig to Hell, of a city of the dead living just beyond the broken walls, and of Unseen Observers who watch over everyone from a secret second metro system built under their feet, and none of it sounds crazy when nobody is sure of anything anymore. One motif that runs throughout the book is one of destiny and predestination, and it is used to explain away some pretty massive narrative conveniences. Several times throughout the story, Artyom finds himself helpless, and just before he is about to die at the hands of one threat or another, he is rescued at the last minute by sheer luck. After this happens a few times, it becomes a tiring cliché, but Glukhovsky does well to use it to his advantage when Artyom's philosophizing reaches its apex near the end. Without spoiling too much, all this narrative convenience--which would be unforgivable in a traditional Western narrative--serves a genuine purpose in illustrating what Glukhovsky is trying to express, and that's a fairly amazing accomplishment. There's plenty to write about this novel, and I feel I'm barely scratching the surface here. Sufficed to say, it's a special book that deserves to have its influence spread a little more widely than it already has. If all you know about it is the video game, please seek out a copy immediately. It's quite different (I've covered those differences in a separate article), but it's also quite good. While I won't be going out of my way to take a second stab at reading Dr. Zhivago any time soon, Metro 2033 has shown me that maybe there is room for a little bit of Russian literature on my bookshelf.